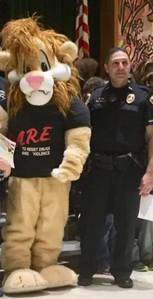 Ridgefield 5th Graders Graduate from D.A.R.E. Congratulations to all of the Farmingville Elementary School 5th graders for graduating from Ridgefield Police Officer Giglio's 5th Grade D.A.R.E. (Drug Abuse Resistance Education), class this past Thursday! D.A.R.E. is a police-officer led series of classroom lessons that gives kids the skills they need to avoid involvement in drugs, gangs, and violence.